If you have chronic pain from osteoarthritis (OA) of the ankle, you're not alone; the vast majority of patients with this problem are women. Fortunately, there are three treatments for serious ankle arthritis, including joint replacement and tissue transplants. The treatment that's right for you depends on your age, activity level, and your disease severity. "It's a good, reliable operation with a predictable outcome," comments Mark Myerson, MD, director of the Institute for Foot and Ankle Reconstruction at Mercy Medical Center in Baltimore. Dr. Myerson, who performs at least 10 operations for ankle arthritis each week, says the success rate is about 95 percent. 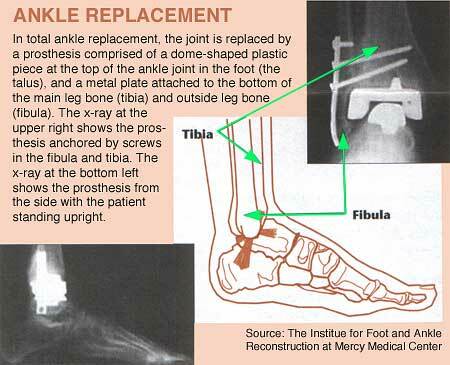 Total ankle joint replacement has come into use over the past seven years. As with knee and hip replacement, the procedure replaces the worn out joint with a prosthetic implant made of metal and plastic. "The results may not be perfect, but they allow for more normal function of the joint, with some freedom of ankle movement. That's important for patients who want to continue activities such as biking, hiking, and climbing," says Dr. Myerson, president-elect of the Association of Orthopedic Foot and Ankle Surgeons (AOFAS). The newest treatment involves transplanting living cartilage and bone. in this procedure, a segment of bone and cartilage is removed from the arthritic ankle and is replaced with a graft of donor tissue. Specialized instruments cut the graft to the exact size and shape of the removed segment. This "allograft" becomes a framework around which the patient's own cells gradually grow, explains Dr. Myerson. At present, the procedure is limited by the availability of living tissue, which is supplied by an organ bank; the waiting lists are long. To determine the most appropriate treatment, a patient's occupation, interests, and typical activities are evaluated. The ideal candidate for ankle replacement is a woman over 50 who does not take part in high impact activities such as jogging or racquet sports. After total ankle replacement, she should be able to walk, bicycle, do yoga, and other activities, says Dr. Myerson. Dr. Myerson recommends fusion for younger people with higher demand occupations or activities, and ankle replacement for patients over 55. He suggests that women aged 3055 consider tissue transplant, because they will have two other options if the graft- doesn't take. Recovery from fusion involves six weeks on crutches, then another six in a protective boot. A fused ankle joint no longer has up and down movement, though adjacent joints may retain limited vertical movement. Eventually, after bearing the brunt of force on the foot, these joints may also begin developing arthritic changes. After an ankle replacement or transplant surgery, a patient uses crutches or a walker for two months. Three weeks after the procedure, patients begin rehabilitation, using aquatic therapy or an exercise bicycle. Within eight weeks, a patient can begin activities such as swimming, cycling, yoga, or hiking. Full movement is never totally regained after joint replacement, but will far exceed a fused ankle's near-immobility. "Cases we have seen so far show no immune response or rejection of the implanted material," Dr. Myerson reports. While the success rate of transplants has been excellent, possible complications include skin healing problems or areas of numbness. if further arthritis develops, another transplant, a traditional ankle replacement, or even fusion may be performed. At least one specialist remains cautious about tissue transplants. "The use of bone and cartilage allografts for ankle arthritis is a very exciting area, but must still be considered experimental," says Martin O'Malley, MD, assistant attending orthopedic surgeon at the Cornell-affiliated Hospital for Special Surgery. The major issue is the viability of transferred cartilage cells--some studies show less than 30 percent of the cells survive, so the long-term survival of the grafts is questionable. Secondary issues include disease transmission, since fresh (not frozen) allografts are used; the ability to obtain a size-matched donor; and rejection of the graft tissue due to incompatibility. Says Dr. O'Malley: "Hopefully, over the next five to ten years, these questions can be answered, and this technique will be available for younger patient as an alternative to fusion or replacement." if you're considering surgery to relieve ankle arthritis, remember "ankle transplant or replacement are very demanding procedures, with a steep learning curve," advises Dr. Myerson. "Experience really counts. Look for a surgeon who performs the operation frequently."